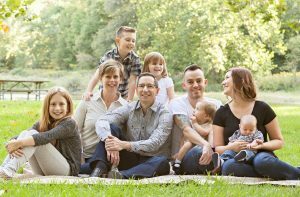 “The greatest thing any parent can do for their kids is to show them they are loved for who they are and for being their authentic selves,” said Peter Tchoryk, who lives in the small town of Dexter, Michigan with his wife. Peter and Sarah have three children, including a son who is transgender. Peter and Sarah know what it’s like to watch their child grapple with discrimination – and through their work organizing with transgender advocacy groups like the National Center for Transgender Equality, they’ve seen the importance of speaking out and pushing back against discrimination. With back-to-school season in full swing, Peter and Sarah want to underline that despite the Trump Administration’s decision to rescind guidance on how public schools can best support transgender students, the root policy – Title IX of the Education Amendments of 1972 – still exists and provides significant protections for transgender students. While it’s been challenging to see anti-transgender perspectives demonstrated so publicly in the past year, from lawmakers to anti-transgender activists to the President of the United States, Peter knows that as we confront prejudice, we also change minds. People across the country are coming together to share their stories and support transgender youth as they head back to school. Read several stories below of parents, children, professionals, and more providing insight into what it’s like to head back to school as a transgender student. Read the entire article by Freedom for ALL Americans. How many of our kids dream of going into space? How many dream of just getting through the next day? As a kid of the 60’s, I’ve been inspired by NASA and the space program for as long as I can remember. It was the reason I went into engineering. I dreamed of endless possibilities. But for many, the possibilities were far from endless. It was a daily struggle to survive. It still is. I was born a couple weeks after Dr. King gave life to the Dream – and only a couple days before the horrific bombing of the 16th St. Baptist Church and vicious murders that ended the lives of four little girls and two young boys. As a nation, how do we reconcile our ability to land a man on the moon within a decade and our inability to end the systematic, violent oppression committed over centuries? How is it possible for otherwise loving people to ignore the dehumanizing effects that result from segregating and isolating others? People who say they harbor no ill-will against the oppressed, but perpetuate a culture of ill-will. Dr. King spoke of the strange paradoxes of a nation founded on the principle that all men were created equal, fighting to maintain a culture of institutionalized segregation and discrimination. On what is being called “Discrimination Sunday,” Texas legislators would have made their Jim Crow-era counterparts proud. One of the bills passed by the Texas House, SB2078, includes an amendment preventing transgender K-12 children from using bathrooms matching their gender identity. Perhaps we should not be surprised. Bathrooms and public spaces were used like a weapon during the Jim Crow era, as segregationists preyed on fears that African Americans would assault white women and children or pass on diseases. Many of the same scare tactics used to justify segregating African Americans are being used today against transgender people, including children. These scare tactics were used to great effect in Houston and North Carolina and adopted as a model by other states trying to pass anti-transgender legislation. How is it possible states can pass this type of legislation despite the overwhelming evidence debunking false claims about safety? This is not just about bathrooms. And we’ve been here before. In her enlightening book, Hidden Figures, Margot Lee Shetterly introduced us to the extraordinary contributions African American women made to NASA and our space program. It was also a stark reminder of the culture of normalcy around segregation and discrimination that endured into the Space Age. African American women like Katherine Johnson, Dorothy Vaughan, and Mary Jackson made great contributions scientifically – and in breaking down barriers of segregation and discrimination. They took a stand. I ask that the people of Texas take a stand – this time with transgender children and their families. Segregation and “separate but equal” are a thinly veiled rejection of the truth that we are all created equal. Segregation dehumanizes. It isolates and denigrates – physically, mentally, emotionally, and spiritually. Thankfully, the lessons of the past are not lost on all. Businesses including IBM, Dell, Amazon, Apple, Google, Facebook, and many others recognize the value of diversity and signed a letter opposing this harmful legislation. As a parent to a young transgender child and the CEO of an aerospace company, I appeal to the millions of companies and organizations in Texas and elsewhere to do the same. To those who may have been silent about injustices in the past — it is never too late to speak out. To those who may have made the wrong choice in the past — it is never too late for redemption. So now, through this redemptive power of love, we can dream of endless possibilities.